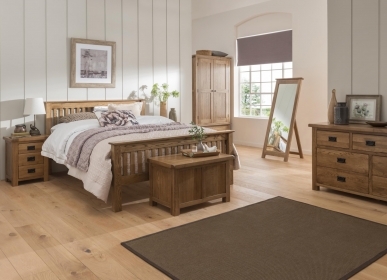 With a traditional, charming feel, this low foot end double bed is handmade from strong, long-lasting premium American White Oak. Sturdily constructed, using traditional techniques, the piece is guaranteed to last a lifetime. Presented in a stylish and smooth lined, rounded edge design and with a lacquered rustic finish, it is would make a stylish addition to your bedroom.